This takes place many years ago in South Central Oregon. Due east of Crater Lake National Park at a place named Savannah. It was almost Halloween and Wendy and I headed into Savannah a few days ahead of the boys. Figured we have ourselves a "women's hunt" for a change of pace. Now just getting into the cabin at Savannah can be challenging dependant on rainfall etc. There are no roads to speak of, only an old blazed trail through a marsh seeking solid ground and the occasional high spot. Once we turn off the dirt road it takes us about an hour to travel the last 6 miles to the cabin. Everything must be taken in with us. This includes firewood for the wood stove, our only heat source and plenty of white gas for the Coleman lanterns. We can only get to within about 300 yards of the cabin because of all the water, so we dawn our waders and begin shuttling gear. Ice chests, groceries, sleeping bags, dog food and you know the rest of the list. We leave our shotguns and vests in the truck, cause we'll be going right by it on our way out in the morning. It always feels great to settle in to the cabin and take in the incredible views. From the front porch you can see the rim of Crater Lake, Mt. Thielson and Mt. Scott to the west. South and east is the Silver Lake road going through the Klamath marsh, not that you can identify vehicles or anything. To the n.w. is Yamsey Mt. and the headwaters of the Williamson River. The next morning we have breakfast, pack lunches for the day and head out to the creek that runs through the property. We actually hunted on a cattle ranch that adjoined our property. The weather was beginning to get cold and a tad bit stormy. Ahh ducky for sure. We set up our decoys in the creek and hunkered in on 1 of the 3 little islands there in the creek. The creek is a slow and meandering waterway. The water is very tanic , murky and a bit pungent. It wasn't long before we were blazing away and had several birds and on our way to a limit. We had a pair of Canada Geese come in and I got one and Wendy shot the other although it went on a death glide. So we pursued quickly, to no avail after more than 2 hours of searching. We came up empty handed. On our way back to the decoys we crossed the weir (bridge) and looked upstream at what was in our decoys. Something just looked out of place. It was hard to see clearly, as the weather was bearing down on us. Cold rain and a serious wind put a chill in the air. Just as we decided to go back to our set, the birds got up and were coming our way. A few Gadwall and Widgeon and a- a - Black (BOOM) Brant! What? Their supposed to be pelagic and at the coast, not 175 miles inland! We are dumbfounded, as we watched Teak(my Yellow Lab) make the retrieve. Still wondering if it really is what we suspect. . . Yep it was a Black Brant. Well it's getting on around 3:00 p.m. so we pick up our decoys and start the long walk back to the cabin. A longer walk going back carrying the ducks and geese that we shot. We were still talking about that Brant, and how amazed the boys will be when they hear about it. By the time we got to the cabin the first snow of the year was upon us. We were tired, hungry and happy to be right where we were. What a great Halloween women's only hunt! The next day the boys arrived and as we figured, they thought we must have mis- identified the Brant. That is until I showed them the head! Jaws dropped. 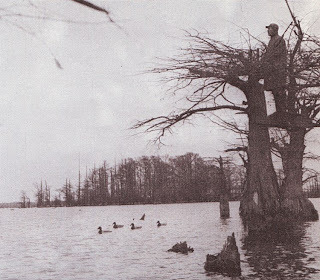 These photos are from a very old book titled The Duck Hunter's Bible by Erwin A. Bauer. Some of these old photos are just priceless. Does this fellow below in the barrel remind you of anyone in particular? Elmer Fudd comes to my mind. I like these gentlemen with the painted landscape scene. Especially their little peep hole, not that they have a roof overhead. . . The above photo (R.) is that of a "piano" blind. So named because of its sloping top on the back side. I have built these blinds and have had many a good shoot in them. They are very comfortable. Bench seats and corner shelves for your coffee and shells. These 2 fellows, I just don't know about. I am sure they had some great stories to tell. 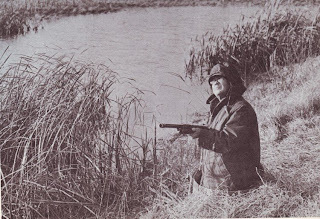 Gives a whole new meaning to pass shooting, and what about retrieving those ducks? I think Kristine at Gun Safety Innovations might have a thought or two about these fellows. Wow, I have been delinquent on my blogging. Life has intervened of recent. Between some physical challenges and trying to keep work coming in, time has gotten away from me. 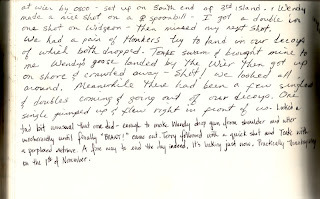 So without any further delays here is a story about a trip my friend Dave Keiser and I took a few years back. This all takes place in British Columbia about 80 km. out of the northern town of Smithers. 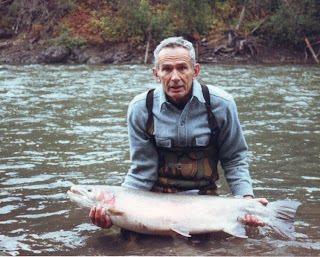 Dave had told me about a place where there were very big Steelhead, in the range of 20 to 30 pounds. Well that certainly caused me some whiplash. Just the mention of Steelhead is usually sufficient enough to get my attention. So the seed had been planted and it wasn't long after when we were making our travel plans for the Babine River. The year was 1987 and the month of September. We booked our reservations at Norlakes Lodge and got busy tying flies for our adventure. I had only been flyfishing for Steelhead since 1985 and Dave was an old pro at it. So I spent a fair amount of time picking his brain about what fly patterns to tie and so on. He was helpful as always and before we knew it we were air born. Landed in Smithers then travelled by van for 80km. to the Babine River. From there we were jet boated down stream to camp at Norlakes Lodge and got settled in. The next morning we awoke early, had breakfast, packed lunches and then headed out in jet boats. It was illegal to fish from a boat on this section and it was fly fishing only and, catch and release. 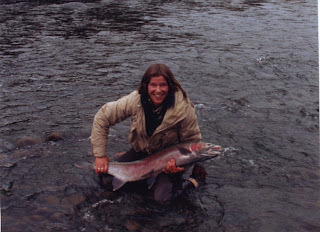 The guides would drop us off one or two to a hole, throughout the 15 or so miles of river that we were able to fish. They came back a few hours later to check in with us to see if we wanted to try another hole or if we needed anything. Typically we started fishing standing back from the bank quite a ways and casting just a few feet into the river from the bank. Eventually working our way out to deeper faster water. Often their would be Steelhead lying close to the bank in the calm water before the sun was up and on the water. I was surprised to catch them only 5 feet out from the bank on several mornings. Those fish are big and strong, really strong. Acting somewhat more like Salmon in ways like sulking and going deep and not jumping. At least the really big Steelhead didn't jump. It took a fairly heavy rod with stout leaders to get them in. The largest I landed was pushing 30 lbs. It had a girth of 22 1/2" and was 39 and1/2 L. and it took me 45 minutes to land. That is what I called a "slab" of a fish, just amazing. Dave's largest was also a slab and much brighter than mine. He estimated the weight to be at 30 lbs. and the lenght 41 1/2". The Babine River is in a remote wilderness and we saw bears daily and heard them thrashing about at camp each night. Definitely had to be attentive to your surroundings at all times. We had our share of rain although still managed to catch fish daily. The Babine is fed by glacial run off, so it doesn't take much precipitation to blow it out of shape and ruin the fishing. I remember the first day I was wading about hip deep and casting when something bumped into my lower leg. I just about flew out of my waders not knowing what it was or being able to see what just bumped into me. Eventually I noticed portions of dead Chum Salmon floating by me that had spawned and were returning downstream. Some had bear bites on them while others were only half of their former selves, having been eaten by bears. Yea, I was a bit concerned for sure about my safety. That was when Dave told me I had nothing to worry about as long as I wasn't the slowest person in camp. Not so sure I was comforted as much as I got a laugh out of his comment and realized the truth of it. None the less we had a great time swinging flies and catching monster Steelhead. 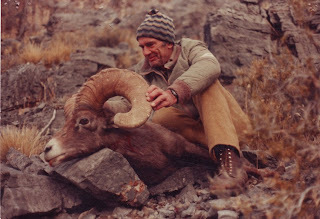 Continuing with some more hunting stories about my friend Dave Keiser and his quest for a Grand Slam on North American Sheep. The year was 1985 and the state Nevada. He put in for a Desert Sheep tag, of which there is only 1 out of state tag per year and 3 in state tags. As luck would have it, Dave got his tag on the first try. He was hunting in an area dedicated to managing sheep called Desert National Wildlife Range. Sparse vegetation and limited water availability, which meant having to pack in your own potable water. The sheep got much of their water needs met by eating cactus, grass and what little brush was available. On the third day of the hunt he and hunting partner went to the S. end of their unit and set up a modest camp near the mountains. The next morning on their way uphill to a glassing area they jumped a large Ram. Not much time for talking so Dave fired a shot off hand and the Sheep didn't go far. Dave was only able to see one side of the Rams horns and knowing it was a legal Ram, yet didn't see the busted horn on the other side. All in all a great animal and nothing to feel bad about. Well now, his next quest is the Stone Sheep and hunting an area which Jack O'Connor made famous with a story titled "A Day In Ram Heaven". This was not going to be an inexpensive hunt considering you had to have a guide. The guides in fact were the ones who controlled the permits and made the final decision, plus he had to get himself up to British Columbia. The year was 1987, Dave and his wife had 5 kids at home and were a bit strapped for cash. He had a chat with his wife and she agreed to cash in their life insurance policy to fund the trip. They both drove up to B.C. together then she wished him luck and flew home. He then flew 80 miles into base camp out of Fort Nelson B.C. and was at the foot of the Canadian Rockies. Here the guide had his main headquarters set up next to a lake, with Moose feeding and creeks choked full of Artic Grayling. He ate more than his share of Grayling on this trip. He had quite the trip this time. His guides were 2 American Indians, one young and one very experienced. He waited and watched as his guides loaded the pack horses and figured he didn't need to keep to close an eye on them, as they must know what to bring and how to properly pack. So with his 2 guides they headed up the Muskwa River drainage going cross country with 4 packed horses. On the way one of the horses fell and ended up dieing from its injuries. Eventually they got to their base camp and set up for the next days hunt. The next morning Dave was without coffee as the guides drank only tea. He wasn't very impressed with their packing job now, and felt maybe he'd been better off to have kept a closer eye on them when they were packing. Anyhow tea it was, and after a quick breakfast the older guide took off and Dave followed. On foot they crossed a creek and began heading up a long series of benches and waterfalls. Never seeing any Sheep this day, although they saw many Caribou as they got into a very large basin. So back to camp they went. The next day they rode up to a good glassing spot in a different basin from the previous day. As they began to eat their lunches, they were glassing the slopes across from them and saw it was full of Sheep. 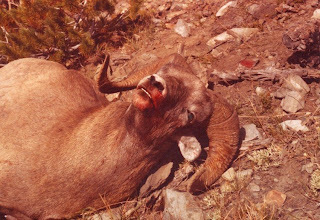 In total 25 Rams they sighted with their spotting scope. No time to waste they got moving downhill, crossed a creek and large ravine and started uphill. It took hours to get above the Rams and then Dave had to wait for his Ram to stand up. Finally he stood. . . Boom! Missed, just over his back. From 400 yards above the Ram he had no idea where the shot came from and was confused. Dave chambered another round into his pre '64 270 cal. and shooting off hand this time, he connected. The big Ram rolled and rolled to the bottom of the canyon breaking off about 3" of horn on the left side. The curl measured 40 1/8 Long. He didn't get a width measurement, although from the photo it is quite wide! The Ram was beautiful and what lie ahead was a very enjoyable evening at camp followed by riding out the next day. Completing his North American Sheep Grand Slam. 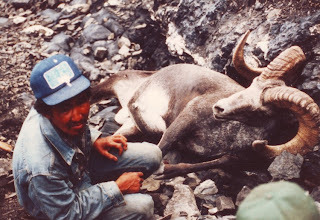 The photo is of his guide with his Stone Sheep. Well, I hope you are beginning to understand why I wanted to brag a bit about Dave. He is an exceptional individual, a great story teller and just a pleasure to be with. I might have one more tails to tell of a trip he and I took many years ago. Let's see now, where was I ? Oh yea, the hunting portion about my friend Dave Keiser. Being an avid hunter since he was a kid and never having much interest in chasing sheep, well that is until he drew his first tag in Oregon. That was in the early 80's and that sparked an interest alright. The first time he puts in for the tag he gets it, and he got his first Bighorn Sheep too! 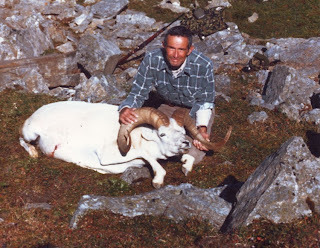 Since he was now inspired to hunt Sheep he put in for Dall sheep. It took him 2 years this time before drawing the coveted tag in 1982. Dave met up with his guide and they were flown in and dropped off near the top of the Alaska Range with 10 days worth of supplies. The law reads that the Dall Sheep must have a full curl to be legal for harvest. They saw rams everyday but none were legal. Not until the sixth day when they were eating breakfast did they see a legal ram. Then, they actually saw 3 legal rams across the valley from where they were. So the long stalk began. They spent several hours going downhill, crossing a stream and gaining elevation so as to get above the ram to have the best possible shot. Realizing that he might only get the one shot on this trip. He and his guide glassed once more to be sure they had the right ram picked out and Dave made an excellent shot. The Dall measured 42" W. with 1 1/8 curl and 38 1/2 L.
Being this was the sixth day he and his guide still had 4 days to wait for the plane. He stashed the meat in a snow bank where the plane landed, yet was concerned about the horns and cape being taken by a bear. So that night he went out of his little pup tent and got the horns and cape and brought them back to his tent. When his guide woke up in the morning he'd never seen such a sight in all his life! Dave was lying on his back sound asleep clutching the horns and cape to his chest. No bear was gonna get away with his Ram! The weather turned for the worse and they got snowed in for the next 3 days. The guide had brought in a bottle of Royal Crown so they drank whiskey and ate Sheep liver til the storm broke and the plane arrived on the tenth day. So, he's half way to his Grand Slam and my money is on him to get the full slam! I'm pretty sure he can get it done if anyone can. Originally I thought to just write a brief story about my friend David Keiser. Then I thought to myself, there's so much to tell that brief would not suffice. So here is the first of a three part story about my friend David Keiser. He is known to his friends as Dave, and as you'll soon discover he is quite an exceptional individual. Dave's most recent achievement was riding in a Dressage event and being inducted into the Centurion Club. This is when the combined age of horse and rider totals 100 years. 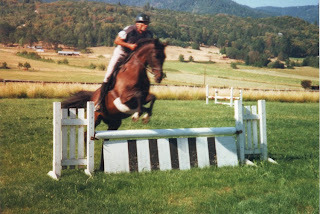 Riding Othello who started out as a "problem horse" when he bought him at 10 years of age. Dave bought a book written by 2 Aussie women and began training Othello. He started from the beginning with ground reins, lunging, lunging with saddle and so forth. Eventually the day came when he needed to put his foot in the stirrup and test the waters. Well, Othello was just as calm as if he'd been ridden a 1000 times. A big sigh of relief for sure and a nice reward for both their hard work. He and Othello competed in Three Day Events for several years as Othello was a natural jumper. Dave eventually transitioned into Dressage competition. After a few years of training and dedication, he and Othello were competing in Dressage events and placing high in the competition. He learned English style riding when he was in grade school, which helped him with dressage. He has been an avid horseman throughout his life, including pack animals for big game hunting. We'll get to that in the next segment and more highlights you won't want to miss. It was a good turnout for the special occasion on Sun. July 6 in Southern Oregon. Family, friends, fellow riders and trainers were all present to honor and celebrate Dave and Othello's accomplishment. Dave and Othello rode at Level 4 which is the highest level ever ridden for a Centurion team. They are the 52 team in the nation and the first male in the state of Oregon. The age thing you're wondering about? Othello is 20 and Dave 81 years young. The photo is of Dave and Othello during their earlier years, practicing jumps when they competed in 3 Day Events. As I fast approach the the half century mark, I am curious as to how one maintains their fitness levels? Perhaps this is not a fun subject, that of aging. Though it is reality if we live long enough. Personally, my younger years were spent competing in alpine skiing which is not the best sport for knees. That is if you want to have good knees when you're older. I have had my share of surgeries, resulting in learning to adjust my fitness goals for the long haul. So the question arises, what types of exercises, frequency, and intensity do you participate in to be ready for the upcoming hunting season? I understand that fitness is more about a "lifestyle" and incorporating exercise into your weekly routine on a year round basis. Somewhere between laundry, groceries, work, family, social gatherings, vacations, kids, spouses and the list goes on. My point being, it isn't that easy to find time for working out with all of life's duties, obligations and commitments. One of the perks is that it takes less time for a workout as I get older. That's just the facts and it's really o.k. 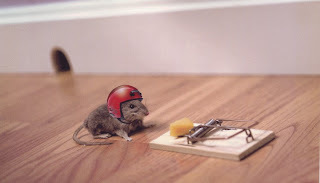 Learning to accept ones limitations is quite beneficial. No more pushing through the pain and impressing . . .Who? What? Why? I can give myself a pat on the back for being kind to myself and having a good quality workout, without damaging my body. I see opportunities much closer at hand than when I was younger. I don't feel that I have to trudge 12 miles in, to find my Buck and haul it out alone. You learn to see things differently and your experiences as a youth give new awareness to opportunities much closer to camp. Lending truth to the age old adage of "the grass isn't always greener on the other side of the fence". As for waterfowl hunting, I am able to make 1 trip to carry my decoys, ground blind and shotgun to where I will be for the day. Not making multiple trips packing gear certainly adds to the enjoyment of the experience. Most of the time during early season waterfowl, I "rough hunt", carrying no more than the essentials for the day. Relying on the habitat for camouflage and having done my homework studying flight patterns and times. I know when it comes right down to it, there's nothing better than walking for fitness. I was amazed at how I " leaned out" during the 7 days I was Elk hunting last Fall. Believe me, I packed plenty of food and munched along the way. Just sustaining a moderate pace throughout the day is a real calorie burner. For obvious reasons you are thrilled to be in the field again with gun in hand. There is so much activity and experience to take in, and the time passes quickly. So the miles you cover are not as noticeable as being indoors sweating in one spot. The treadmill and stationary bike are dismal substitutes for being in the field. Please let me know what your physical preparation is for the Fall hunting season. Do you load your pack and go for a hike, simulating packing out your big Buck? Or running, weights, kayak, etc. etc. And if there is a way to enjoy sweating in one spot, please share your secret with me. I will be forever indebted to you! The above photo was taken in 1988 during my cross country bike trip. This was the "high point" of the trip. 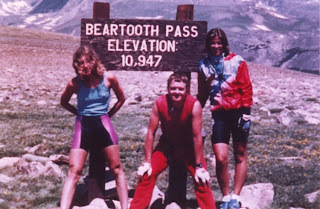 Myself and 2 new friends took a side trip through Cook City and over Beartooth Pass (Absaroka Mtns.) down to Red Lodge and into Billings Mt., where we rejoined the rest of our group. If you want to read more about that adventure, let me know and I can mix it in. Otherwise, stay cool and drink lots of water.